Most modern up-to-date debugging equipment. 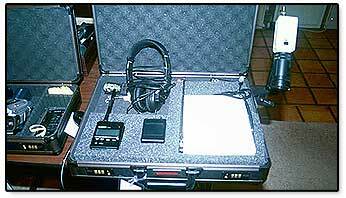 Same as used by LAPD, United Nations and the CIA. Don't Lose That Big Contract Because Someone is Listening. Does It Seem That Your Competitor Always Knows Your Next Move? Is Your Spouse or Ex-Spouse Listening In? 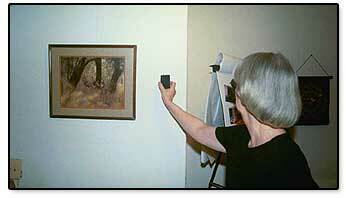 LET FIND ANYONE DE-BUG YOUR HOUSE, CAR, APARTMENT, OFFICE with state of the art debugging equipment. Agent operating CSD21... This unit will quickly locate all types of transmitters, including room bugs, body wires, bumper beepers, video transmitters, microwave transmitters, telephone recording devices, series telephone taps and Infinity telephone devices as well as computer and fax information transmitters. 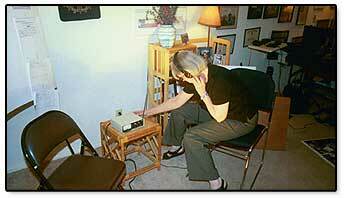 Agent using DET2 frequency counter. 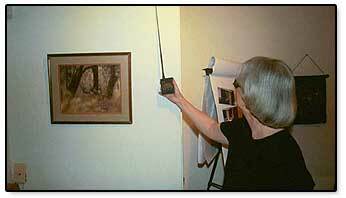 The best device known today for hidden transmitter search. Used for walls, cars, etc. Agent using SBD5h looking for concealed room bugs. This device has a high detection range of 5 ghz.